Forman Journalism Society in collaboration with GEEKS INN arranged a seminar on “Tips on News Anchoring” on 03 January 2018 in E25. 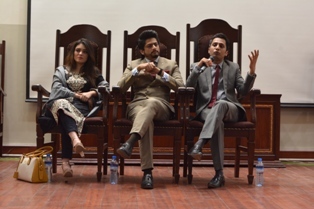 The worthy guests of the event were Rizwan Sarwar Bhatti, CEO GEEKS INN TV, Sadaf Durrani, Anchorperson express TV and Sultan Bukhari, Anchorperson 92 news. 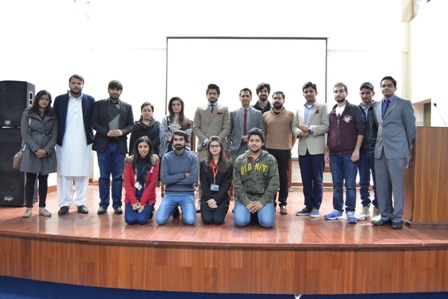 The event took place under the supervision of Society Advisor and Lecturer, Syed M Saqib Saleem and Lecturer, Ms Nida Tahseen, from the Mass Communication Department, was also present. The first speaker Ms Sadaf talked about the skills of news anchoring/program hosting and emphasized on how proficiency in Urdu language and passion are important for success in anchoring in Pakistan. Second speaker Mr Sultan from 92 News again emphasized on passion and how one must be passionate about joining media and becoming an anchor. Sultan Bukhari also emphasized on the importance of physique and good voice as an anchor. Rizwan Sarwar Bhatti who is the head of Geeks Inn, concluded the session by explaining about the concept of Geeks In TV and their services.